Extra Small Nut Wizard - Black Walnut Cracker for Serious Nut Crackers! The extra small Nut Wizard is a great acorn picker-upper. 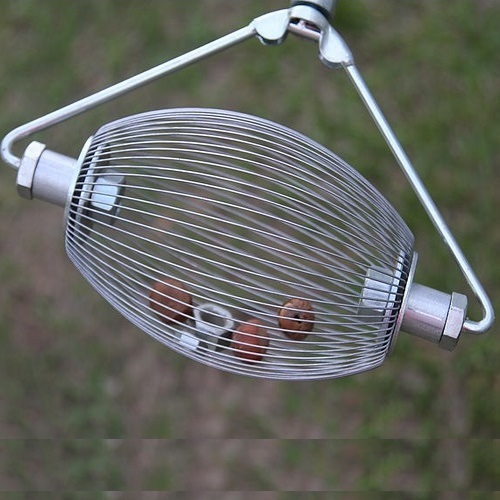 This nut roller uses rows of metal wires to make up the basket. These thin metal wires spread open, easily picking up acorns, pecans, and other nuts from the grass or ground, without losing what has already been collected. The Nut Wizard's basket rolls easily, unlike other nut picker-uppers we have tried. This easy spin motion ensures the nut roller can be pick up pecans with little back-tracking. The extra small Nut Wizard also comes with a nut dumper. The nut dumper attaches to any 5 gallon bucket. Once the pecan roller is full simply push the basket on the dumper and it will spread the wire apart, releasing your bounty. nut picker, nut roller, nut picker-upper, basket nut tool, nut grabber, yard roller, walnut roller, nut tool, walnut rake, nut collector, acron rake, and acron gatherer. I'm so glad I found this. Finally-- a solution to picking up these annoying acorns. Now my dogs have to actually eat their food.